This is a breathtaking moment where a man can see his wife again after almost a decade. A clinical trial led by University of Leicester respiratory experts into a potentially ground-breaking ‘breath test’ to detect lung cancer is set to get underway at the Glenfield Hospital in Leicester. It is hoped that the LuCID (Lung Cancer Indicator Detection) programme will lead to a non-invasive method of diagnosing lung cancer in the early stages. 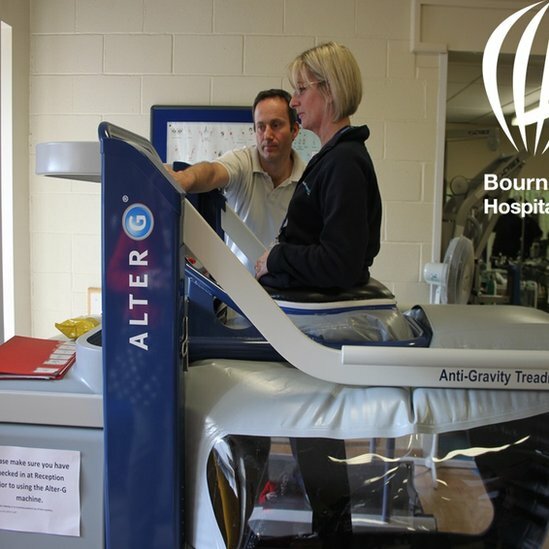 A treadmill using technology designed for astronauts is being used to help patients in Bournemouth. It will be used to help people with leg injuries and disorders recover, as they can exercise without putting their whole body weight on their legs. Patients with arthritis of the knee joint and some with lower back pain, are zipped into a sealed bag which is then pumped with air. Their body weight is reduced by as much as 80% while they use they machine.